babbling brook, the leinsterfans.com supporters forum • View topic - Another stupid question: Are bags allowed at RDS? Another stupid question: Are bags allowed at RDS? Pardon my yankee ignorance, but some sporting venues in the USA do not allow handbags or backpacks. Others allow them, but require they be searched at the gate. Since my family of six will be out and about Dublin leading up to the match vs. Ulster, we'll probably have a backpack or two with us. Will this be a problem? I searched, but google has failed me on this. PS - I caught a stream of the match vs. Northampton today. 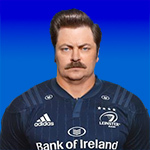 I was worried after Leinster failed to get over the line at the end of the first half, but they came on strong late. Re: Another stupid question: Are bags allowed at RDS? Not a problem - bags are fine. That's great to hear. Thanks for the quick reply. cvd6262 wrote: That's great to hear. Thanks for the quick reply. Just make sure the bags have regulation length straps!